Henry ’09 and Amanda Trujillo ’08 McGill at the Monumental Core of Park Güell in Barcelona, Spain. My name is Eric Mac Lain, and this past December, I became a Clemson alumnus. It was a day I thought would never come, but now that I am reflecting on it, I realize it happened in what seemed to be a blink of an eye. My experiences at Clemson were second to none. I was very fortunate to have been a team captain during our special 2015 football season (14-1), losing only to Alabama in the National Championship. I graduated with a B.S. in health science and was able to start my master’s program in athletic leadership. This past fall, I had the honor of introducing Vice President Joe Biden when he spoke at Clemson. More important than all of that, I found my future wife at Clemson. We met freshman year because she and my roommate were family friends, and I tagged along to a cookout. We became good friends and started dating two years later. So the phrase Clemson family is very real to me! Her father and other relatives went to Clemson, and both of our brothers now attend Clemson. It is safe to say that orange will run in our bloodlines for many years to come. There is something special about Clemson that’s not true about every other University. As soon as we aren’t at Clemson or at least nearby, we miss it. I can attest to this because I have been away this spring training for the NFL, and cannot wait to be back in Tiger town. I’m Eric Mac Lain and this is MY Clemson. CU soon! 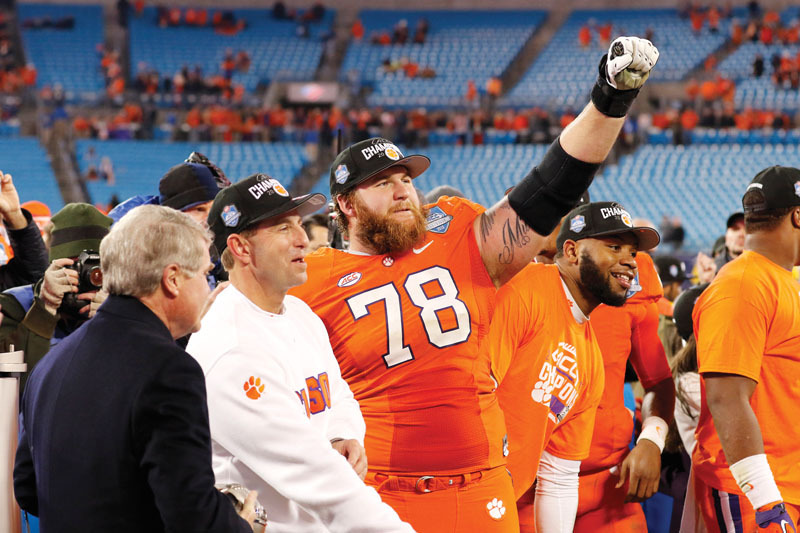 You probably saw Eric Mac Lain during the coverage of the Orange Bowl and the National Championship as he was being interviewed by what seemed like every reporter in the country. Click on the photos below to see more about Eric’s life at Clemson. Weston Houck ’04 and Ashley Houck ’06 visited Notre Dame Cathedral in Paris in March 2016…Go Tigers! Kemper and Sarah Brand flew out to Phoenix, AZ, to see the Tigers play for the National Championship! On the morning of the big game, they climbed Camelback Mountain just outside of Phoenix. The awe-inspiring views at the pinnacle made the tough, rugged 1,300-foot ascent well worth it. It was a wonderful part of the travel experience across the country! This is my husband, Stephen Carlson. Stephen graduated from Clemson University in 2012 with a degree in Audio Technology and completed four years of Army ROTC. After college, Stephen went to flight school for a couple of years and is now a Black Hawk helicopter pilot for the United States Army. Stephen is a dedicated, talented, and proficient pilot and a wonderful husband. We love Clemson and our country. Go Tigers! Thousands of Clemson fans came from near and far to cheer the Tigers on at the Russell Athletic Bowl in January. The Alumni Association, IPTAY and the Orlando Clemson Club sponsored a variety of events to welcome the faithful to Orlando. The night before the game, more than 300 fans invaded Miller’s Ale House for an event sponsored by the Orlando Club. Participants enjoyed live music and a silent auction that raised money for scholarships. Fans also enjoyed a “Pre-Tailgate Tailgate” on game day, sponsored by the club. The Orlando Club and the Alumni Association found time for some good deeds as well, as they co-hosted a volunteer event during the bowl festivities. Alumni from the local area as well as Tigers traveling from out of town gathered at Clean the World on Sunday to sort donated hygiene products and prepare them for recycling. Clean the World collects and recycles hygiene products discarded by the hospitality industry and distributes them to impoverished people locally and around the world. FanFest at Russell Athletic Bowl was the site for a ONE Clemson Tailgate before the game, sponsored by IPTAY and the Alumni Association. A live deejay provided entertainment, and President Clements and his family welcomed everyone to Orlando. Fans were able to also enjoy the activities and games put on by FanFest, then walk across the street to cheer on the Tigers. Those staying at the team hotel got an unexpected treat when they welcomed the team back in a spontaneous “Tiger Walk” in the halls of the hotel. Players walked through a tunnel of fans, punctuated with Cadence Counts and high fives.